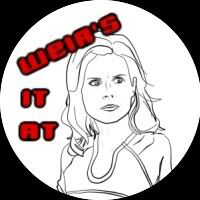 Pegasus 3 - Weir's It At badges - need opinions! Anyone around to give opinions on the proposed P3 Weir badge? Nebulan provided the line art and I've made a few mockups for badge designs, not that I'm a wonderful graphics person or anything. 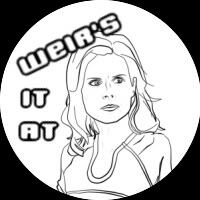 I might change the font possibly or colour in Weir maybe? The catchphrase is at the request of million_moments. If anyone has an ideas please share! It's a bit bigger than fullsize atm - they will be for 38mm badges of which I was gonna get 50 to take to Pegasus 3. I think the red background one is best, i think changing the font could be a good plan, i dont know it just looks a bit off to me. I like the one with the red background - it stands out the most. I kind of like a cross between the first and second ones. 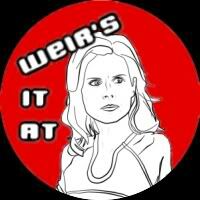 You know how Weir always wears red shirts? Maybe making that red instead of the background and leaving the text red as well. I like them, although I think the first two, with the red bits, are the best. I think colouring in Weir would be good as well. The one with the red background works well as it is, but if you did colour Weir in, then I think just having a white background and the red text would look good.